Before having kids I wasn’t one to make time for myself to get my hair or nails done, let alone go to a spa. I can honestly say that I have never even stepped foot in a spa! Gosh, I wish I would have known then what I know now! I would have gone to the spa every weekend! Since those days are seemingly long gone, I decided to take matters into my own hands. 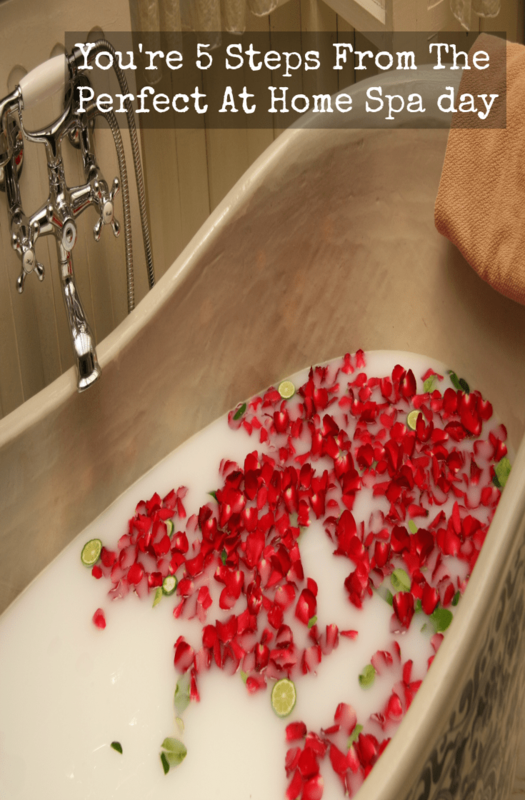 An home spa day is easy to pull off, and chances are you have everything you need somewhere in your house! Make sure you get time alone. This step is key. If you are going to even attempt an at home spa day, you need to set aside a few hours of time just for YOU. Ask your hubby to take the kids over to grandma and grandpas for the day, or out and about for errands or to a children’s museum without you. The kids will appreciate solo time with daddy while you get to appreciate some much needed alone time! Facial mask. A face mask is a great way to exfoliate and refresh your skin. The Tammy Fender Epi-Peel, is a 5 minute exfoliater, mask and peel all in one. This holistic formula peels away dead skin and livens up your pores for natural radiant look. You can use your fingers to “paint” the mask on to your face. Let the mask dry for about 5 minutes for a smooth and moisturized face. Sugar scrub your dry skin away. Those sugar scrubs that you find at the beauty counter are actually really inexpensive to make on your own. All you need is 2 parts white sugar, 1 part Olive or Coconut Oil, and 1/2 teaspoon of Vitamin E oil. You can break open Vitamin E capsules if that’s what you have on hand. You can even add vanilla extract or lemon oil! Rub the sugar scrub in circles all over in a slow motion. Once you are finished, step into a warm shower to rinse off. Your skin will be silky smooth when you are done! Soak your worries away!Fill up a tub with warm water and a little bit of Soap & Paper Factory Luxe Bubble Bath with Tuberose, and just ease on in. Soak for 10-15 minutes. You will emerge feeling relaxed and refreshed. Slather yourself with creams. It’s time to moisturize now that you’ve gotten rid of all of that dry, dead skin. You will want to look for a lotion that is light in fragrance, because fragrance typically equals high alcohol concentration, which also equals drying. It is best to moisturize right after a warm, steamy shower when your pores are still open. You will also want to use a body lotion for your body, and a facial moisturizer for your face. The skin on your face has different needs than the rest of your body. I was lucky enough to have the whole house to myself for an entire afternoon! My fingers and toes got painted, my skin got scrubbed and my face has never felt better. I am so glad to have gotten a few hours of alone time to focus on just me, but I was sure happy to see the boys when they got home! It’s funny how much you miss them when it’s quiet! Get the Epi-Peel from Tammy Fender for yourself for $80 , and don’t forget the Luxe Bubble bath with tuberose from the Soap & Paper Factory for $32.